Do you enjoy bathroom breaks and sick time at work? Does your paycheck arrive on time every month? While these standard labor practices are recognized in many workplaces, there are still employers who regularly and unapologetically refuse to recognize the law. As a result, hundreds of employees endure abusive working conditions each year in the City of San Francisco alone. However, these employees now have a chance at justice. And in your support of DataCenter, you had a hand in elevating the voices of workers so they can demand that chance. On August 2, 2011, San Francisco city officials enacted the Wage Theft Prevention Ordinance, which strengthens the city’s ability to enforce labor laws. 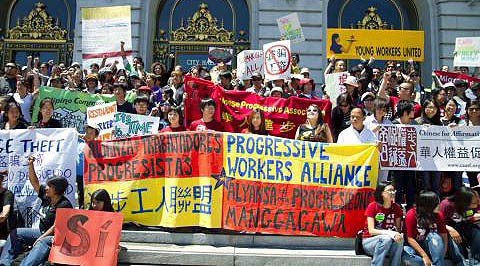 Led by the Progressive Worker Alliance, the campaign was fortified by the 2010 Chinese Progressive Association Report Check, Please!, which DataCenter helped write, that exposed the sweatshop conditions of Chinatown restaurant workers. The stories and testimonies of low-wage workers, both in the Check, Please! Report and city council hearings, were the driving force of creating positive, imperative social change for workers in San Francisco. The San Francisco Wage Theft Prevention Ordinance is one step closer to justice for workers in the city community and across the globe. Other partners that participated in the implementation of the Check, Please! Report include San Francisco Department of Public Health; University of California San Francisco Medical School; University of California Berkeley School of Public Health; and the University of California, Berkeley Labor Occupational Health Program.